"Turn over a new leaf and realise your body's potential"
Long summer days have left us for awhile, so what next? Maybe a touch of fun in the snow? That’s agreed then and with the winter season generally December to April no time to lose, kick on. Having worked 2 winter seasons on the mountain I was shocked by the lack of preparation that was not undertaken by so many in advance of their holiday. Which just added up to very expensive coffee breaks, as their stamina ran out and muscles seized up. 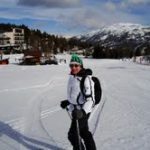 How long to get fit for skiing, snowboarding etc? – well minimum time should be 6 weeks but maximum time is unlimited, obviously depending on where your fitness is at the start of the preparation will have an effect. Whilst most bursts of activity are limited in time it still makes sense to have a good base level of aerobic fitness. There are greater demands on your breathing at altitude so find out your trainers and get active, whether it be power walking, running, cycling, cardio exercise classes, gym cv kit or swimming. 3 x per week for 30-40 minutes each visit should put you in a good place especially if you are working at a reasonable intensity. Sensible approach though if you have not been active for a little while. On to the muscle work, partly for strengthening (lower reps/higher weights) and endurance (higher reps/lower weights). So for the legs in the gym…… leg press, extensions, curls, adduction (inner thigh muscles act as the prime movers in recreational skiing) and abduction. If away from the gym then squats, lunges, step up’s, lying leg abduction, adduction squeezes on a swiss ball will all go along way to preparing you for the mountain challenge. In the past a wall/ski sit was often used to strengthen up but now I would suggest using it as a gauge of your improvement as the weeks go by, though not advisable for those with high blood pressure! Do not neglect the upper body in your fitness workouts, some press up’s, upright rows, lateral pulldowns and shoulder presses will all help with your performance and ability to carry your skis. Let us move on to Core Strength, this has a big part to play in ski fitness so do not neglect it. Yes mountain exercise involves legs, legs and more legs but it also requires your lower back, hip flexors and abdominals to be tuned up as well. If you do neglect your core then your posture is likely to break down under pressure. Bring on the planks, side planks, table, bridging, abdominal curls etc and all you need is floor space. To progress your core training you can add swiss balls, stability discs, wobbleboards etc. Finally flexibility, co-ordination and balance exercises will give you the finishing touches to the winter sports preparation and whilst some of this crosses over from the core section there is no harm in reaffirming that with further specific training. Pilates and Yoga classes can be a useful addition to give you a rounded fitness level. Five minutes of thorough stretching after every workout should always be encouraged and may I suggest after every day on the slopes, delay the first drink to allow that chance to stretch those tired muscles which should help when you wake the following morning. Finally and especially if you are a first timer maybe consider a visit to a snow dome or dry ski slope before you go just to get the feeling of putting on ski boots, ski’s or snowboards as it will put you one step ahead when you come to get on the white stuff. This is just a guide to getting the most out of your winter sports holiday and I would always advise a check up with your doctor if you have not been active for awhile prior to your holiday, plus if working out in the gym use the experience of the instructors there to guide you if you are using unfamiliar equipment. GO AND HAVE FUN, IT’S A GREAT EXPERIENCE! Fill out the simple form below and I will get back to you as soon as I can.